On September 3, 1925, the U.S. Navy airship U.S.S. Shenandoah (ZR-1), crashed in Ohio, killing fourteen members of the crew. U.S.S. 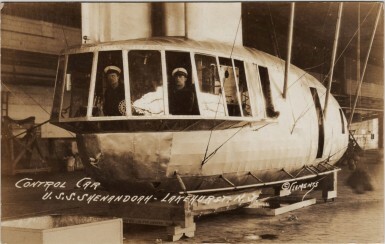 Shenandoah was based on the design of a World War I German Zeppelin, L-49, that had been forced down in France in October, 1917. L-49 was one of the “height climbers” designed by Germany late in the war; the strength of the ship’s aluminum framework had been dramatically reduced to allow it to reach the high altitudes necessary to escape Allied fighters and anti-aircraft artillery. This decrease in strength was accepted as a wartime necessity but copying the design for an American airship may have had tragic consequences. In the mid-1920s, members of congress and other politicians put pressure on the Navy Department to send Shenandoah and her companion, U.S.S. Los Angeles, on publicity flights around the country. Midwestern politicians were especially anxious for the airships to visit their part of the country and pressed the Navy to schedule a midwestern flight. Shenandoah’s commanding officer, Lt. Cdr. Zachary Lansdowne, was well aware of his ship’s structure limitations, and as an Ohio native he was also familiar with the severe summer thunderstorms that occur in the midwest. On June 15, 1925, Lansdowne wrote to Admiral Edward Walter Eberle, Chief of Naval Operations, suggesting that the midwestern flight be postponed until the thunderstorm season had passed. Eberle was unmoved, and Lansdowne’s appeal to Rear Admiral William A. Moffett, Chief of the Bureau of Aeronautics, achieved nothing but a slight delay; the midwestern flight would proceed in late August or early September. Lansdowne made another attempt to postpone the midwestern flight but was again rebuffed; on August 12, 1925, Admiral Eberle wrote to Lansdowne, “Your recommendation to make the flight the second week in September has not been approved.” Lansdowne was ordered to begin the flight on September 2 so the ship could fly over the State Fair in Columbus, Ohio on September 3, and then appear over the state fairs in Des Moines, Minneapolis, Milwaukee, and Detroit. As the flight approached, the Navy Department added more towns to the list of places the airship was expected to appear to satisfy political interests; Lansdowne was ultimately ordered to fly his ship over 40 cities and towns in the midwest. Shenandoah was over Ohio, as ordered, on September 3, 1925, when the ship was caught in the type of storm Lansdowne had been warning about. The ship rose rapidly in convective updrafts, at a rate eventually exceeding 1,000 feet per minute, until it reached an altitude over 6,000 feet. Shenandoah rose, fell, and was twisted by the storm, finally suffering a catastrophic structural failure. The ship broke in two at frame 125, approximately 220 feet from the bow. The aft section sank rapidly, with two of the engine cars breaking away and falling to the ground, killing their mechanics. The control car, attached to the bow section, separated from the ship and crashed to the ground, killing the six men still aboard, including Lansdowne. Without the weight of the control car, the remaining bow section, with seven men aboard, including navigator Charles Rosendahl, ascended rapidly. Under Rosendahl’s leadership, the men in the bow valved helium from the cells and free-ballooned the bow to a relatively gentle landing. Two schools of thought developed about the cause of the crash. One theory is that the gas cells over-expanded as the shop rose, due to Lansdowne’s earlier decision to remove 10 of the ship’s 18 automatic gas valves to limit the loss of helium by leakage and eliminate several hundred pounds of weight. These valves automatically released helium as the ship climbed to avoid over-expansion of the cells at higher altitude, and Lansdowne’s modification limited the amount of gas that could be valved in a given time. With the elimination of these 10 devices, Shenandoah’s remaining valves could not keep up with a climb greater than 400 feet per minute, and as the cells over-expanded they damaged the ships rigid framework. But Karl Arnstein, the stress engineer who designed the L-49 from which Shenandoah was copied, blamed the crash on the decision to operate a ship of that design in adverse weather. The German height-climbers were never intended to operate in difficult weather conditions, Arnstein explained, or over large land masses with their potentially violent updrafts and downdrafts. World War I zeppelins were operated infrequently, when the weather was good, and in the relatively calm atmosphere over the open ocean. And the very shape of Shenandoah — its thin, pencil-like hull — reduced its ability to withstand bending forces. The next zeppelins designed by Arnstein, the U.S.S. Akron and U.S.S. Macon, would have a very different profile. Ultimately, a ship designed for calm nights over the North Sea should never have been operated in thunderstorms over the American midwest. It may fairly be said that Shenandoah was destroyed by politics as much as the weather. I have pictures of the Shenandoah crash. My grandparents took my mom and uncle to the crash site. My Great Grandmother had a farm, just over the hill from the crash site. She said she heard a terrible roar when it went down. Interesting post. While the story of the loss of the Shenandoah is well known, I was not aware of Landsdowne’s repeated efforts to avoid these dangerous weather conditions. Fascinating insight. First rule of LTA travel – avoid Midwestern late Summer squall lines. The rest is academic. No airship ever made could have survived that storm had they flown into it like the ZRS-1 did.